Extra Speakers Gets Stuff Heard! Need some serious sound? Try our dual speaker setup with a total of 1000 watts of power! Also included is a wireless microphone - making this a perfect system for public speaking, or, plug in your favorite music playlist and rock out to your favorite tunes. 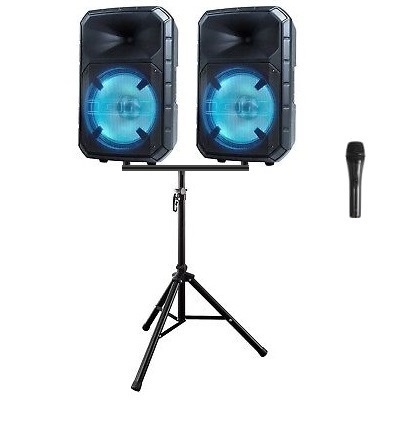 Includes: 2 - 500w speakers w/stands, Wireless microphone w/stand and Aux cord.